Topps Tiffany baseball cards offer collectors a more upscale option for many sets from the Junk Wax Era. 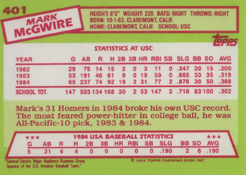 Between 1984 and 1991 Topps made a relatively limited number of factory sets that came with better production values. Secondary values of Topps Tiffany cards are much stronger than their regular Topps counterparts. Topps Tiffany cards are instantly recognizable in-person because of their white card stock. Regular Topps cards from the era traditionally used a grey stock. Card fronts also have a glossy finish, giving them a slick feel. Factory sets come with relatively plain packaging. Most have a solid-color box with gold font and an elegant border. None refer to the name "Topps Tiffany." Rather, that was a nickname given to the cards later on. Box sets also have a gold seal, which can help collectors tell if a set has been opened. Many of these sets were originally only offered to hobby shop owners and dealers. Topps did offer some direct through ads in specialty sports publications as well. These cards rose in popularity as professional grading exploded in the late 1990s. Collectors became more aware of their scarcity and accepted them as something more than an oddball card. With the massive print runs of base sets from the 1980s and early 90s, Topps Tiffany cards are an excellent alternative for those looking for high-end collectibles. It's unlikely the 1986 Topps Traded Barry Bonds or 1984 Topps Don Mattingly rookies will ever come close to their heights they once held. However, the comparatively limited availability of Tiffany versions could appreciate nicely over time. Collectors often look for the best card of a player. For the most part, Topps Tiffany represents that for 1980s baseball cards. Topps stopped making Tiffany sets following 1991 Topps Traded. The company did bring them back similarly styled sets in 2001 and 2002. 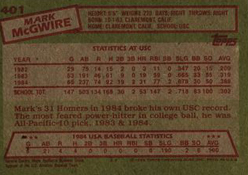 Below is a breakdown of all Topps Tiffany Baseball sets released between 1984 and 1991. We've included key cards and, where available, print runs. You can click on the set name to shop for cards on eBay. We've also linked to several of the best Topps Tiffany baseball cards. I have three versions of the 1987 Topps Traded Maddux 70T card. The first is the tiffany (glossy and no asterisks on back), the second regular version (with asterisks on back), and recently I acquired a third which is a regular version but with no asterisks on the back. Does anyone know the meaning of the asterisks or is this third version a rarity? Thanks in advance. GF bought what she thought was Tiffany Ken Griffey Jr cards. You say it’s easy to tell because of the white stock. I’ve searched the ends of the internet for an answer. Apparently the “traded” ones were on white stock also. So that isn’t a definitive answer. Others say Tiffany ones don’t have these”**” on the bottom back. Glossy or not I don’t know. Don’t want to take them out. Just when I thought they were Tiffany (because of white stock) i see posts saying otherwise. Found several places where the two were placed side by side front and back but posts were so old the pictures are gone. All it would take is the two side by side, might clear a lot of confusion up. My God why is this so hard. Topps traded. All that I have are on White stock. You say that the ** On the back are definitive. DEFINITIVE OF WHAT? Definitive that they ARE the Tiffany versions? Or definitive that they are NOT the Tiffany version?